The Congress on Monday alleged that farmer suicides have increased by 41.7 per cent since the formation of the Modi government in May 2014 and accused it of shedding "false tears" for them while benefiting the middlemen. "The report of Crime Records Bureau shows that farmer suicides have grown by 41.7 per cent since the formation of the Modi government. The maximum suicides have taken place in Maharashtra. 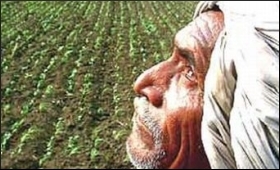 The number of farmer suicides in Maharashtra stood at 2,414 from January to October last year," Congress leaders Randeep Singh Surjewala and R.P.N. Singh said in a statement. They said the BJP had promised to pay farmers 50 per cent over their input cost but nowhere was the promise fulfilled. "In several states the Minimum Support Price fixed is 24 to 32 per cent less than the cost price," the leaders said. They said that agriculture exports have fallen in the last four years and imports have risen due to which farmers are getting less for their produce. The Congress leader said that the Commission for Agricultural Costs and Prices has noted in its report that maximum agricultural imports took place in 2016-17 when the Modi government imported 57.50 lakh tonnes of wheat and 60.60 lakh tonnes of pulses. "This happened when wheat production in 2016-17 was 983 lakh tonnes and pulses 229 lakh tonnes. Was it not well-thought-out conspiracy to benefit the middlemen? It is clear that the Modi government sheds false tears for farmers and benefits the middlemen," the Congress leaders alleged.